For those lovers of the 4-string tenor banjo, the choices in today’s banjo market are few. 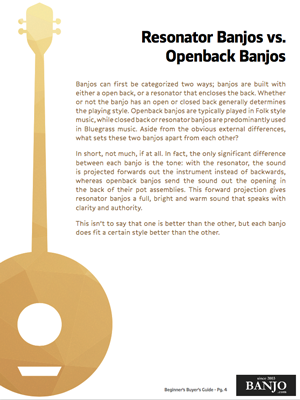 For those lovers of the 4-string tenor banjo, the choices in today’s banjo market are few. If you don’t care to spend the thousands of dollars necessary to purchase a collectible, vintage instrument, why not get the same musical utility in a brand-new, affordably priced Rover® RB-45T! The RB-45T is faithfully patterned after the finest vintage instruments–right down to its classic “fiddle-shaped” peghead! The resonator and slim, carefully proportioned neck are period correct, and the lightweight aluminum rim with built-in tonering is a Rover® exclusive–found on no other banjo at this attractive price point. With its polished mahogany and bright nickel-plated metal parts, it’s a banjo you’ll be proud to own and play!